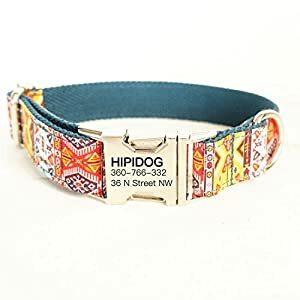 There are all sorts of ways that you can ensure that your Dog’s collar is unique and stylish whilst ensuring that it also contains all the key safety information. We have pulled together a list of our favourites and separated them under the following headings to make is easy for you to find what your looking for. 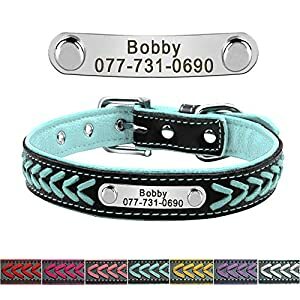 Keeping scrolling if you are looking for more information on what it is that you need to consider when buying a custom dog collar. We have pulled together our favourites in a handy comparison table to get you started, you can read about each product in more depth underneath, or jump straight to our buyers guide. 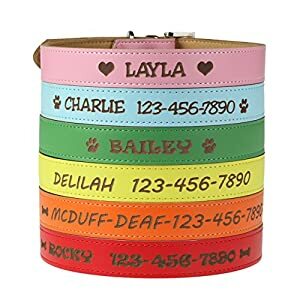 This dog collar with name embroidered is a personalized dog collar that lets you add text like your dog’s name, your address or phone no., etc. You can add a maximum of 24 characters and icon. The dog collar is 100% computer-generated/integrated with the collar’s fabric. You won’t have to worry about stickers or decals falling off. The collar itself includes nick-plated hardware that’s weather-resistant. That includes d-ring, metal clasp, and metal keeper to prevent resizing. This Custom Catch leather collar is available in various sizes including XS, S, M, and L. It’s important to get your dog’s exact neck measurement and can fit 2 fingers between the collar and dog’s neck. The collar features engraving with text like the dog’s name or your phone number. You can easily create a computer-customized style you want for the collar like Paw, Heart, or Bone. Since the text is engraved you won’t have to worry about it fading. These tags are also less noisy than ID dog tags made of metal. The collar is also available in different colors. They include green, blue, red, yellow, orange, and pink. 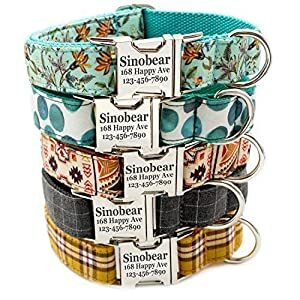 The manufacturer offers 100% guaranteed quality and is certain you’ll be happy about this dog collar for your pet pooch. These custom dog collars from hipidog are hand-made. It includes a unique design that includes interior of nylon and exterior of lint. The collar is customizable so you can pick your size, pattern, and text. You’ll have to get your dog’s neck measurement to pick the right size collar. You have the option of 5 sizes, and nearly 20 patterns. The collar also includes a matching leash to form a set. The buckle/clip are made of stainless/durable alloy. This collar includes many features. They include washable fabric, double-layer belt, sturdy/lightweight buckle, and hand-sewing. The collar is also mildew-resistant. This customized dog collar lets you add text like your dog’s name, your address/phone no., etc. The color/text is bonded to the collar so it won’t wear off or wear down like embroidery. The collar is made of durable polyester webbing vs. regular nylon. Polyester repels water/mildew/rot and doesn’t stretch when wet. The high-quality buckle is made of Duraflex vs. nylon/metal. This provides benefits like better strength, moisture/salt water-resistance. These dog collars include a strong metal buckle that’s quick-release. This allows you to remove the collar in many emergency situations quickly. The dog collars are also reflective so vehicles can see your canine at nighttime. This customized dog collar includes name plate for your doggy. Like pet’s name, your address/phone no. 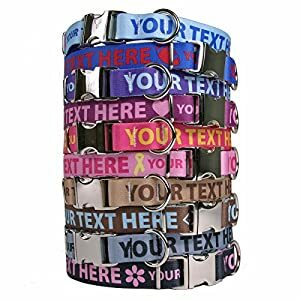 Text can be laser-engraved onto metal buckle. You can also pick the collar’s size and color when ordering. Sizes available include XS, S, M, and L.
These Personalised dog collars feature laser engraving for the ID collar that can help prevent lost dogs. The engraving can be placed on metal buckle and last for years. You can add text like your pooch’s name, or your address/phone no. Three different fonts are available including Times New Roman, Arial, and Georgia. Different sizes are available to match your dog’s neck. They include XS, M, L, and XL. This allows you to fit small/medium/large dogs. The buckle is durable and quick-release so you can remove it quickly in emergency situations. An optional matching leash Is available. The collar includes a 1-year quality guarantee. This is a small dog collar that’s available in various colors. 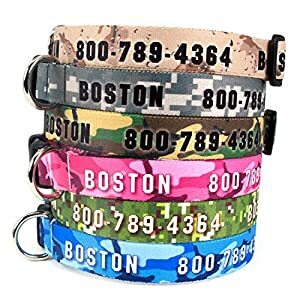 Unlike other dog collars with name and phone number this one doesn’t include customized engraving. The material is made of high-density polyester to provide durable/soft touch. The buckles are made of strong alloy so won’t rust easily. The nylon dog collar is easy to put on and will help to keep your dog safe/secure. The company offers 24-hour customer service and 100% satisfaction guarantee. The company will replace/refund the collar if you’re fully satisfied. These personalised collars are hand-made with faux leather/soft suede and braided design. The leather trims make the collar look more charming and unique. The inner is soft/comfy and flexible leather delivers snug wear for your pooch. The engraved collars include stainless steel nameplate that let you add text for different dog breeds. The collars are available in different sizes so it’s important to measure your dog’s neck so you can get a snug-fitting collar. Make sure to refer to the company’s sizing chart. The manufacturer also offers a quality guarantee. You can contact the compact for a refund/replacement if you’re not fully satisfied with the dog collar. Different companies offer a different amount of text that can be engraved on the ID tag. It’s usually about 4 lines and 70 characters. Having more or fewer lines can affect your ability to add the info you want on the tag. The engraving method is important because it affects factors like the appearance and longevity. Look for processes like laser engraving since they tend to be long-lasting. It’s critical to research the particular method a company uses. Here’s why. If someone finds your lost dog it’s critical that they be able to read the engraved text like the pooch’s name, owner’s address/phone number, etc. If the engraving isn’t deep it’s more likely the lettering will fade sooner rather than later. Finally, make sure that the ID tag actually includes graving. Sometimes you’ll find cheap dog collars with items like stickers and decals. The problem is these peel of easily, which could make it tougher for someone to contact you if they find your lost dog. As always you can usually find several online reviews for certain brands/models of customized dog collars. Some sites provide full reviews while customers might take to social media to share their experiences. Watch out for fake reviews. One way to do that is to read ones like Amazon’s Verified Purchase reviews. You’re more likely to get honest reviews than from standard customer reviews that might actually be sponsored content. 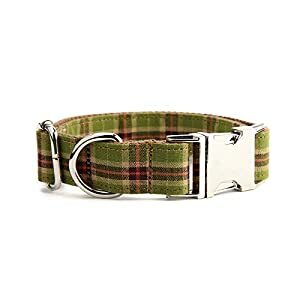 You can find customizable dog collars in a wide range of collars and patterns. This offers more flexibility. For example, you might want to pick a color that complements your pet’s coat. It should be noted that form should follow function when picking a collar. 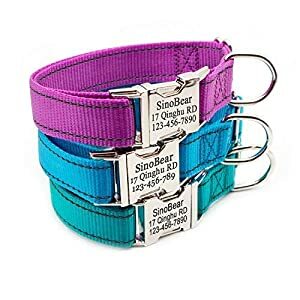 If there are issues with the material, buckles, or tag then the collar being available in 20 colors doesn’t mean much. The collar’s materials and craftsmanship are the biggest factors that affect the durability. Even if you maintain a unit with flimsy materials it will still likely fall apart quickly. This is why it’s better to spend a little more money on a high-quality collar with solid materials. This issue is especially important if your dog is a large breed. In that case it’s especially easier for the dog to chew itself out of the collar. This can put your pet at risk if they run away and there’s no ID tag for identification purposes. This is critical in case you have any questions or problems related to dog collars. You should have different options like phone, email, and social. The company should also reply relatively quickly and deal with any issues you have. This is especially true about ones like shipping, defects, warranties, etc. Watch out for companies with little or no after-sales service. You won’t find many lifetime warranties for dog collars but sometimes short-term limited warranties are offered. These tend to cover things like defects due to materials/craftsmanship. A satisfaction/quality guarantee is more common. This usually gives you the ability to get a refund/replacement if you’re not 100% happy with the product. Be on alert because some “quality guarantees” aren’t clear about what the company is offering if you’re an unhappy customer. You can find tons of companies that make customized dog tags. Make sure to research a particular one to find out some specifics about the company. When was it founded? Where is it headquartered? Have its products received mostly positive or negative reviews? Today’s consumers put a high value on transparency. If you can’t find any info about a particular company then it’s a red flag. The company should provide some basic information about its founding, mission, vision, and so on. Today many customers are looking for products that are made in the USA. Keep in mind this can involve different issues like where the produced was sourced, made, and shipped. These are all different factors so it’s good to know whether a product was truly made in a particular country. When picking a dog collar this is more complicated than it might seem at first. The basic sizes are Small, Medium, Large, with Extra Small/Large sometimes being offered. The problem is different companies use different sizing charts. So instead of automatically picking the size of your dog’s last collar make sure to get its exact measurements. For example, one company’s XS might be another company’s S.
How snug should the collar be? The general rule is you should be able to fit two fingers between the dog collar and pet’s neck. This will provide some wiggle room but not too much that they can easily escape from the collar. The collar’s price is based on factors like the material, buckle, tag, and others. You can find several quality customized dog collars in the under-$50 range. Make sure you’re not only paying a low price but also getting good value. For example, it’s not worth paying $10 for a collar that’s easy for your dog to escape from or has a faulty buckle, for example. You usually won’t find too many extras that are bundled with dog collars. However, one relatively common one is an optional matching leash. This is usually sold separately so it’s technically not bundled with the collar. Why is this a good option? When buying a dog collar you’ll want the tag and leash to be as compatible as possible. This doesn’t mean it’s 100% necessary to buy all items from the same manufacturer but it makes the process easier. When picking a collar different materials include leather, faux leather, nylon, etc. Keep in mind that all types of materials have pros and cons. While leather is durable it doesn’t hold up well to moisture. Nylon is lightweight but less durable than leather. You should also consider the material used for components like the tag and buckle. Look for durable materials like stainless steel since they’ll be better resistant to water, rust, etc. Make sure the tag isn’t flimsy since this contains important info about your dog. Then there’s the hardware. This includes small items that have a big effect on the collar’s functionality. Look for items with extra protection like nickel plating since it will help boost the collar’s durability.